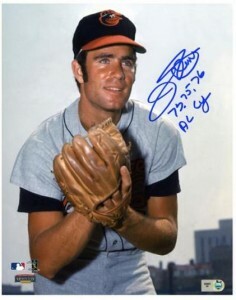 Jim Palmer cards and autographed memorabilia are popular with a variety of collectors. Perhaps none more so than fans of the Baltimore Orioles. He played his entire 19-year career with the team. When you think Hall of Fame pitcher, a resume like Jim Palmer's might come to mind. He was selected to the All-Star team six-times, won four Gold Gloves and helped anchor a pitching staff that won three World Series Championships. Palmer has two rookie cards, 1966 O-Pee-Chee and 1966 Topps Baseball. 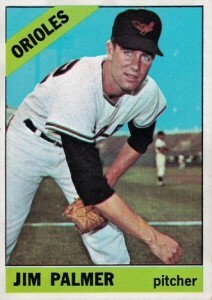 Additionally, he has Orioles team-issued postcards from 1965 and 1966. Palmer's first autographed card is a premium in the 1994 Nabisco All-Stars set. However, his 1997 Donruss Signature Series card is his first fully licensed autograph. It is numbered to 2,000. 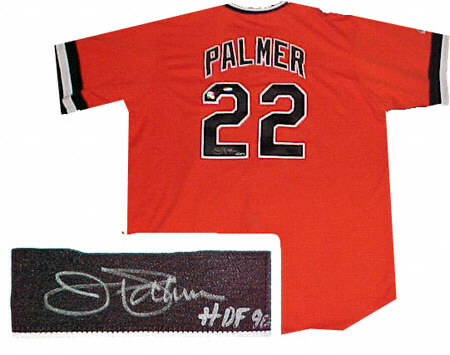 Palmer's first memorabilia card was released in the 2000 Upper Deck Legends set. The card, which is not serial numbered, contains a swatch of game-worn jersey material. 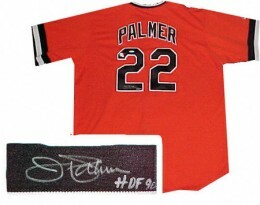 The value of Jim Palmer's autographed memorabilia has remained steady through the years. He is a frequent guest at organized signing events. Anything related to his Worlds Series Championships carry a premium. The Topps and O-Pee-Chee versions are identical in design on the front. The only difference between the two is the bilingual text on the back of the O-Pee-Chee version. Although much tougher to find than the Topps card, it doesn't carry much of a premium. 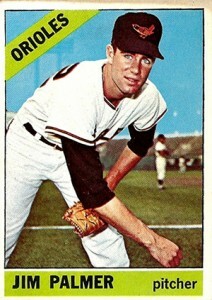 Similar to Palmer's O-Pee-Chee rookie card, the Topps version is known for centering issues and rough edges. As one might expect, high-grade versions certified by a reputable grading company fetch higher prices. 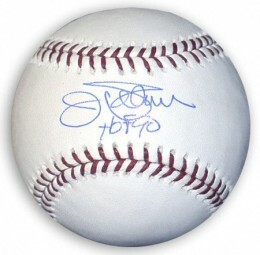 Below you will find an example of what Jim Palmer's authentic signature looks like. This can be used as a first point of reference for determining the legitimacy of autograph memorabilia, but is not a substitute for having your items authenticated by a well-respected professional autograph authentication company. Some of the trusted sources within the sports memorabilia market include the following companies: PSA, JSA, Steiner, Mounted Memories and Tristar. Click on any of the images below to view full size photos. Hastily written, the signature is largely indecipherable by letter. The first character "J" looks like an awkward numeral "8" or even a backwards Pac-man shape. The "i-m" in is first name is absent. The remaining character is unique to the signer and not distinguishable. 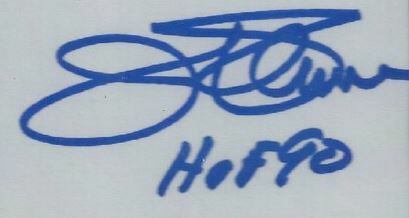 He usually includes the inscription "HOF90" with his autograph.